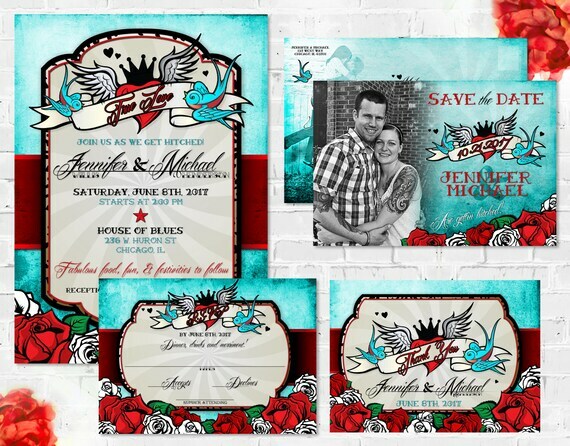 Set your offbeat wedding in style with our Tattoo Themed Wedding Invitation Set, featuring roses, swallow birds and other tattoo styled rockabilly elements. Rockabilly Wedding Invitation and stationery are perfect choices for the rocker couple who knows what they want and won't settle for anything less. Pairs well with the matching rsvp and is an offbeat choice from other traditional wedding themes. PURCHASE: Find a design you like, add it to your cart, then complete payment. • and any other information you would like included. ♥ PROOF: I will email you your initial “proof ” within 24 hours (email is sent to your address on file with Etsy). Once you receive your proof, please review and notify me of any changes. • Once everything is verified, please reply back to indicate that you approve the proof. Please double check that all wording is correct! *** OddLotPaperie is not responsible for errors not caught by the customer on approved PROOF images. Changes also cannot be accepted after PROOF has been approved. ♥ONE ROUND of revisions included with purchase. - Font color changes ARE included with purchase. - Graphics changes & color changes ARE NOT included with purchase. If you would like to add additional coordinating items please visit the add-on section. please email me via the contact link or doubleactiondesign@gmail.com and let me know what you need such as matching products, insert cards, wedding signs, wedding programs, you name it! i'd love to complete your wedding stationery set for your big day! Reproduction of Odd Lot Paperie designs is strictly prohibited.